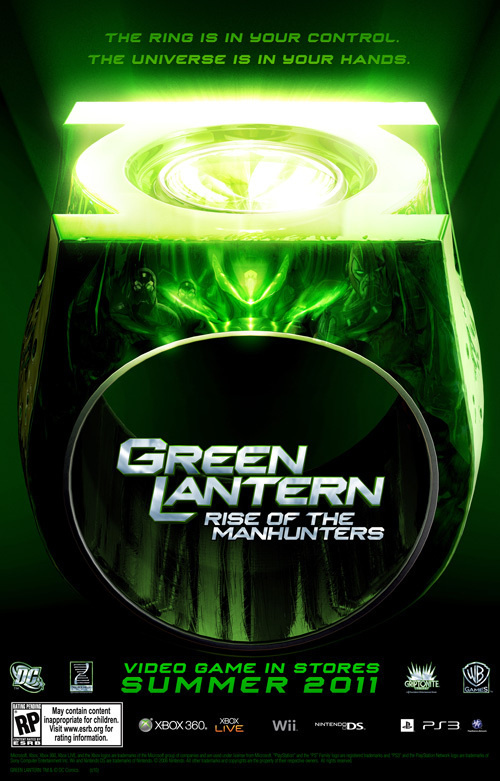 Due out next summer, the obligatory video game tie-in to the Green Lantern movie starring Ryan Reynolds, Green Lantern: Rise of the Manhunters, will give players the chance to take control of the Green Lantern and play through a story that will be connected to the movie, but also follow an independent storyline. Generally, video game tie-ins with movies tend to fail epically, with very few exceptions. If you are hoping for something like “but this game will be the exception!”, keep hoping. Sure, it would be great if this game is an exception to the rule, but beyond the inherent problems with a video game adaptation of a movie, the Green Lantern is not a character that easily lends itself to video games. Several Green Lantern games have been proposed over the years, and none have made it to the shelves, and the few instances where Green Lantern is featured in a game — as with Mortal Kombat vs. DC Universe –– generally have the character using their amazing cosmic ring to make a giant cartoon-like hammer or a green beam of light. By the very nature of the Green Lantern’s powers, the game would have to limit the character’s abilities to make it work in a video game. If they could manage it, the game might be worth checking out. There is so much potential with the character, both in terms of gameplay and in the universe of the Green Lantern, that to do it correctly might be something worth taking note. We’ll have to reserve judgment until we know more. The game’s detail are still being guarded, but as the title suggests, the Manhunters will be the primary threat. In the comics, the Manhunters are a race of robots created by the Guardians of the Universe to keep peace before the Green Lanterns were created. The Manhunters were assigned to keep order, but they eventually determined that the only way to truly keep order in the universe was to wipe out all life. Hopefully, developer Double Helix games can break the mold and create a video game movie-tie in that pleases fans and gamers alike. The game will be available on all consoles, and is likely scheduled for release around the time of the movie’s June 17, 2011 release date.